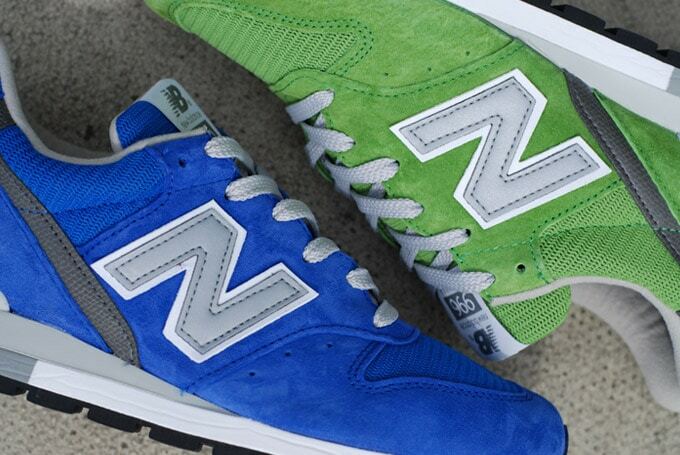 Home Trainers	New Balance M996s in green & blue are better than all hype shoes combined! New Balance M996s in green & blue are better than all hype shoes combined! The M996 is another jewel in the New Balance heritage line. It’s a flawless, pioneering, premium runner with a perfect pedigree and, unlike most other shoes from 1987, the retro does it justice, meaning you don’t have to suffer shoe envy when you see unwearable, crumbling OGs on display. It’s as if this shoe never went away. As we wait for the US-made (no M998 sole on an M997 upper 997.5 type antics) M997 to arrive next year, we’re loving the attention that has been lavished on the 99X line, from that mind-blowing Maine-made M990 anniversary edition to the ever popular M998 reissue. The shoe worn by Mike Tyson, doing roadwork at his fighting peak stays classic, with that slight switch in shape over its predecessor and the angular heel overlays. We love the blast of light that Scotchlite ‘N’ unleashes, plus the build and pick of suedes. ENCAP and C-CAP comfort indicates that NB were far, far ahead of the competition in serious running stakes at this point in time. These colourways are on point, but that green on the M996GRN (can you decipher that fiendishly difficult three letter code?) makes it one of the best NB releases this year. The royal blue M996RYL is a thing of greatness too to sit alongside last year’s burgundy pair in the shoes-people-will-pay-lots-for-on-eBay-in-three-years stakes, but the apple green they used on the GRNs is one of those moments when New Balance hits it out the park like only they can. Some brands do the killer colourways, but they lose marks for synthetic suede and a cheap feel. Both pairs are in the Crooked Tongues store right now. In a world where buyers wanted to know where their £139 was going when they paid big money for a shoe, these would be the shoes shifting in minutes at midnight, but we’ve noticed the M996 steadily amassing fans over the last few months. Nothing comes close to US-made NBs right now if you’re tired of pleather, banana-toed weak offerings pretending to be the shoes you once coveted, which makes them a pick-me-up that’s work picking up.